Sharing more than 200 never-before-published full-color photographs from his personal archives, bestselling author Erich von Däniken provides clear evidence of ancient alien contact and technology among the archaeological sites of the Maya as well as other ancient cultures, such as the Aztecs and the Hindus. 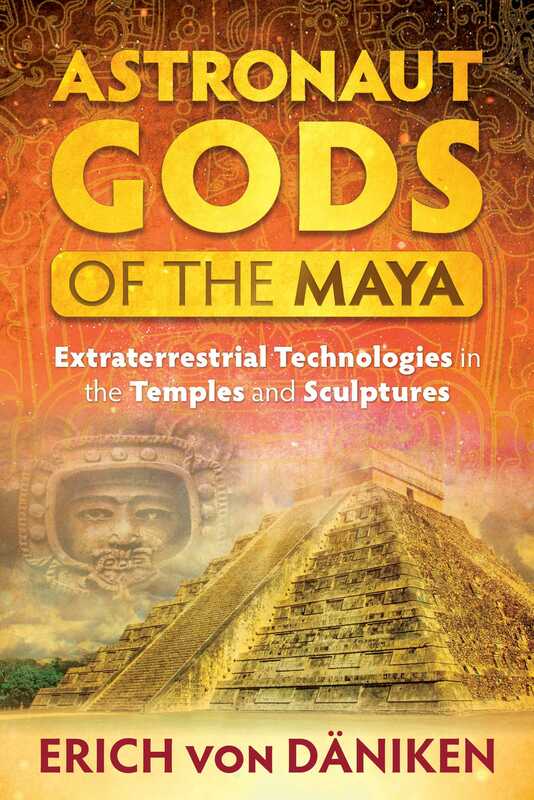 He reveals how the “gods” immortalized in Maya sculptures, carved reliefs, and myth were not supernatural beings but technologically advanced visitors, astronauts who gifted the Maya with their sophisticated understanding of calendar time and cosmology. He explains how, with no explanation for their technologies and origins, the Maya interpreted the visitors as divine and, thus, the “gods” were born. Examining stone carvings and statues from many Mesoamerican sites such as Palenque, Chichén Itzá, and Teotihuacán in Mexico and Tikal in Guatemala, von Däniken reveals the astronaut technology--helmets, tanks, hoses, keyboards, rockets--clearly illustrated in these ancient depictions of the gods. He explores the similarities of Plato’s writings with the Chilam Balam books of Mexico and compares “ancient alien” features in myths around the world, paralleling how mercury is mentioned as a fuel ingredient of flying machines in ancient India with the discovery of mercury at Copán, Palenque, and Teotihuacán as well as in the grave of a Chinese emperor and two Egyptian graves on Nabta Playa. Illustrating the similarities of Mayan step pyramids with those of Kanchipuram in South India, the author explains how Mayan pyramids are crowned with a small temple, residence, or landing field of the gods, while the pyramids of South India are topped with a Vimana, a “godly” flying vehicle. The ruin sites of Tikal lie in current-day Guatemala; its beginnings go back to approximately 1000 B.C. (Remember: Ancient Rome was supposedly founded in 753 B.C.) One of the steles of Tikal is known as “pre-classical stele,” and its origination has been disputed. Today it is in a small museum with other ruins of Tikal. The head of the stele has been cut off, but one can recognize the chest, two bent elbows, decorated forearms, and both hands, which clearly have boxinglike gloves. Below, experts recognize a horizontal crest with double snake heads. The middle of the statue contains the spinal cord, then--still lower--a wide belt, thighs, and finally the feet. Scholars recognize a loincloth covered with jade pearls and sandals on the feet. The arms seem to hold a form of a ceremonial rod, which ends in small snake heads. But how objective is this description from the “experts”? We can clearly see wide bands that lie around the wrists, and the gloves could be recognized even by a child. In order to highlight the technical particulars, I have colored the image a bit. The supposed “spinal cord” could be a bent tube that empties into a small box. A spinal cord must run perpendicular to the coccyx. In reality, the feet are in boots, and out of each boot winds a curious hose. The Maya themselves were barefoot or wore sandals. What were the boots with the hoses? Is the creator of the heavenly family really shown here? Are bracelets, gloves, spinal cord, small boxes, boots, and hoses not just other misunderstandings of technology? Had the artist carved something with holy respect into the stone, which he himself did not understand? The question is absurd, because the world of the Mayans did not have countless related representations at which to marvel. In Guatemala, not far from the Pacific coast, is the small village El Baúl. I found the village’s attraction in an open, wind- and weatheraffected wooden shed near a sugar factory. The El-Baúl-Monument No. 27, as the location is officially known, is 2.54 meters (8'4") tall and 1.47 meters (4'10") wide. Centuries ago it was accidentally found in a forest clearing and left there. The stele shows a dominating form that holds its hands on its hips. The hands seem to be protected by boxing gloves, and in each hand the figure holds a tennis ball–sized ball. Thoroughly modern, the feet of the figure are in boots that reach to the knees and cover knickerbocker-like pants. A wide belt separates the pants from a sharply angled upper body. This figure--if you believe it—was dressed in the fashion of its time. But the helmet, which covers the entire head, is perplexing. Like a diving outfit, it has large coils on the shoulders. From the helmet, a tube reaches to a box, similar to a tank, on the back. When observed closer, one recognizes a peephole in the helmet, and behind it, the nose and left eye of the helmet wearer. It gets stranger. In direct extension of the nose, but outside of the helmet, the stone mason modeled an animal snout, maybe that of a jaguar. Out of the snarling jaw blows--as if pushed out--a cloud of breath from the helmet wearer. According to experts, the relic represents a scene from the deadly ball game of the Maya. The winner wore the mask of a monkey, jaguar, or possibly also an opossum. Therefore the “hose” from the helmet to the tank is nothing other than the tail of a small opossum, and the expressed air symbolizes water, since the opossum is a water animal. An academic explanation--though ultimately as imaginative as my meaning. Why would a ball player put on the mask of an animal since it would only hinder them? The Maya played an extremely fast game. The players’ eyes must react lightning-fast. The face behind the mask is given only a limited view. And why should the player hang the tail of an opossum behind the oversize ears of the helmet? What is the tank on the back? For comparison: The ball player of Chichén Itzá (Mexico) carried neither animal masks nor possum tails behind their ears. Let alone these vessels on their backs. I have a different interpretation. What the predecessors of the Maya thought was a “god” was actually an extraterrestrial. He wore a closed helmet with a view. This is because of earthly composition and bacteria. From one tank on the back, a chemical mixture flowed out, which enriched or disinfected our air. The consumed air was outcast again. The entire body stays in narrow, impenetrable overalls, finished with high boots. Just as was true for the artists in Christian churches, the stonemason of Monument No. 27 from El Baúl has never come face to face with this “god.” This meeting lay far, far in the past. The detailed work of the artist originated from the fantasy of custom, similar to current artists that draw Jesus on his ascension over a stone altar even though they were not present for the actual event.